Anybody still wonders where EyeFi cloud went? When you have a K-1, K-s2, K-70 or K-3II you will not be able to use it even though the Camera has wifi. Need to buy a card. This is a big finger in the face of Pentax buyers. Maybe Pentax users could benefit from an even better service ? Yeah real funny the unsupported K-1. Also real funny for people who had to buy a flash for the K-3 II or K-1, because it was sacrificed for wi-fi and gps. Now they will have to buy a wi-fi card still. 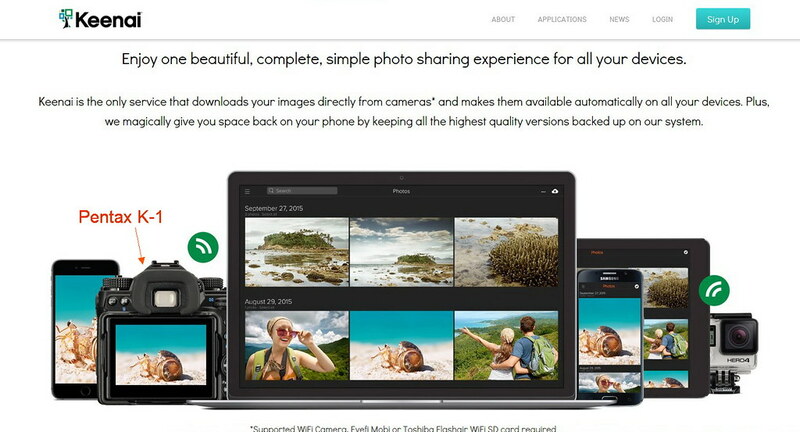 Keenai: Keenai - Android Apps on Google Play Ricoh Innovations corporation and not Ricoh Imaging Company ltd, which makes the image sync app. I cannot imagine such a marketing nonsense ! Something hasn't been issued YET. But we can be pretty sure that the next DSLR model will include native integration, similar to the Eye-Fi integration that was offered a few years back. The lack of direct Pentax camera compatibility is, no doubt, a leftover from EyeFi's compatibility efforts. I bet Ricoh wanted to launch Keenai as soon as possible and did not have time to add functionality beyond what was there before Ricoh entered the picture. I'm sure Ricoh will extend compatibility to Pentax but it might take a few months and maybe a camera firmware upgrade. I'm sadly laughing at the headline of the press release: "Ricoh Innovations Corp. Debuts Keenai, One-Stop Smart Photo Management for All the Latest Smartphones and Digital Cameras". I suppose the K-1 is no longer the latest. Did we miss the new FF body announcement? Ricoh's a big company, and whoever had this project wasn't working with the camera division. Ricoh Innovations is a California-based division, not part of Ricoh Imaging USA, wherever their secret HQ is nowadays. Keenai transfers, organizes and syncs all your photos across all your devices - beautifully displayed, all together and instantly accessible on your Windows phone, tablet, PC or smart TV. But it's funny that the opening shot on the Keenai site of the trees is an aerial shot from a drone. How will an image like that automatically find its way into Keenai? As Adam said, Keenai is a product of Ricoh Innovations... not Ricoh Imaging.